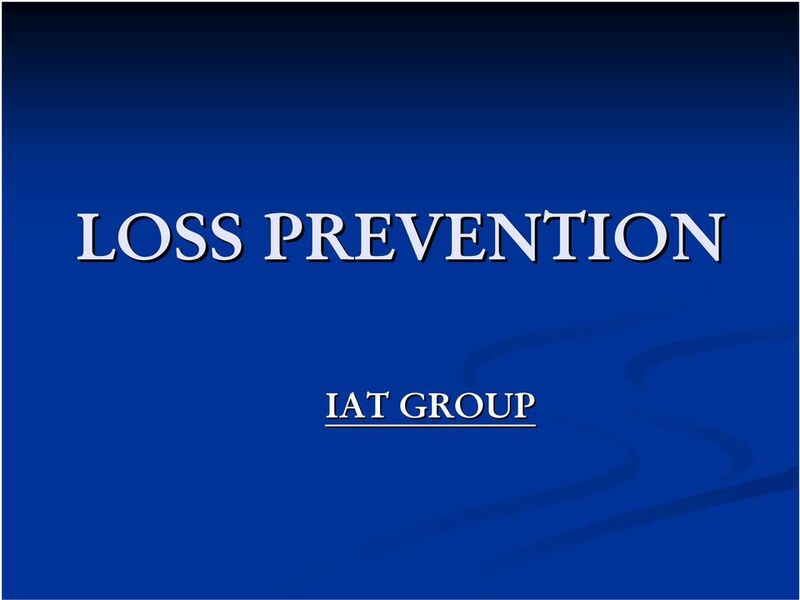 Download "LOSS PREVENTION IAT GROUP"
2 CARGO SECURITY AND LOSS PREVENTION Introduction Cargo protection requires thorough planning to be effective and remain effective through changing conditions. 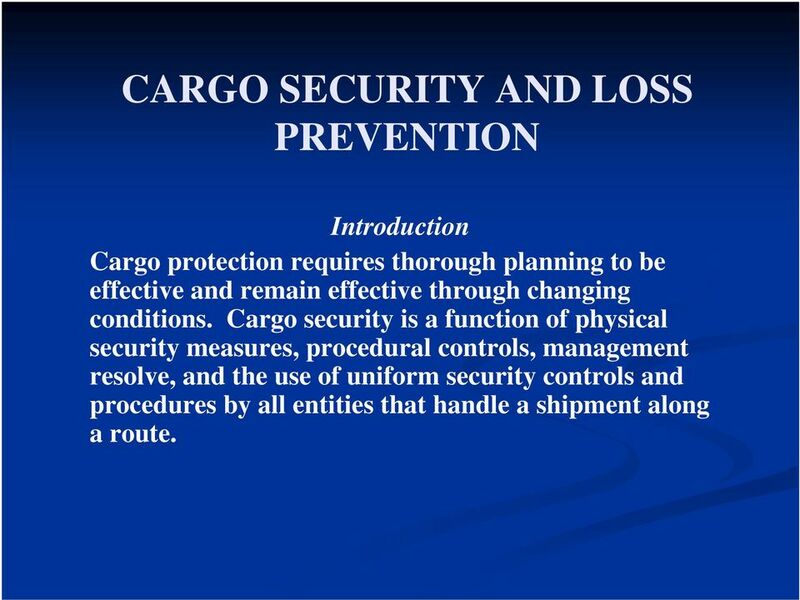 Cargo security is a function of physical security measures, procedural controls, management resolve, and the use of uniform security controls and procedures by all entities that handle a shipment along a route. 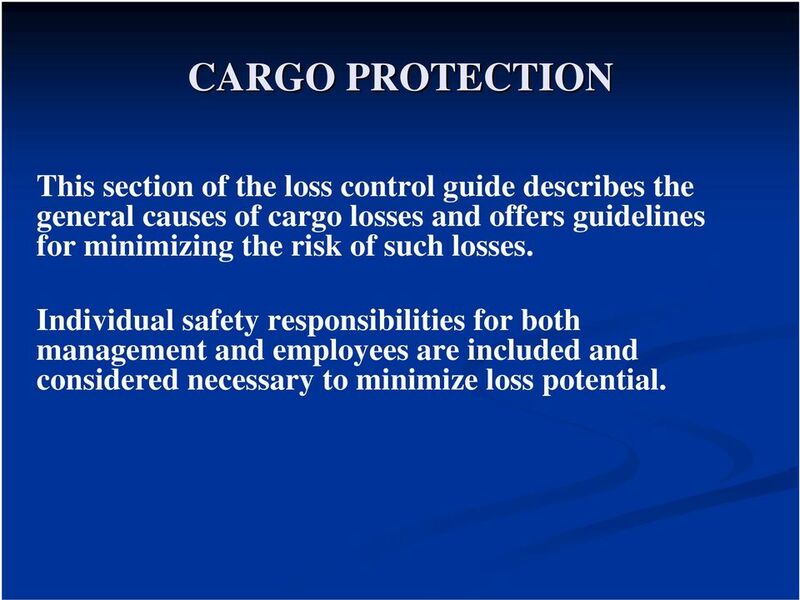 3 CARGO PROTECTION This section of the loss control guide describes the general causes of cargo losses and offers guidelines for minimizing the risk of such losses. 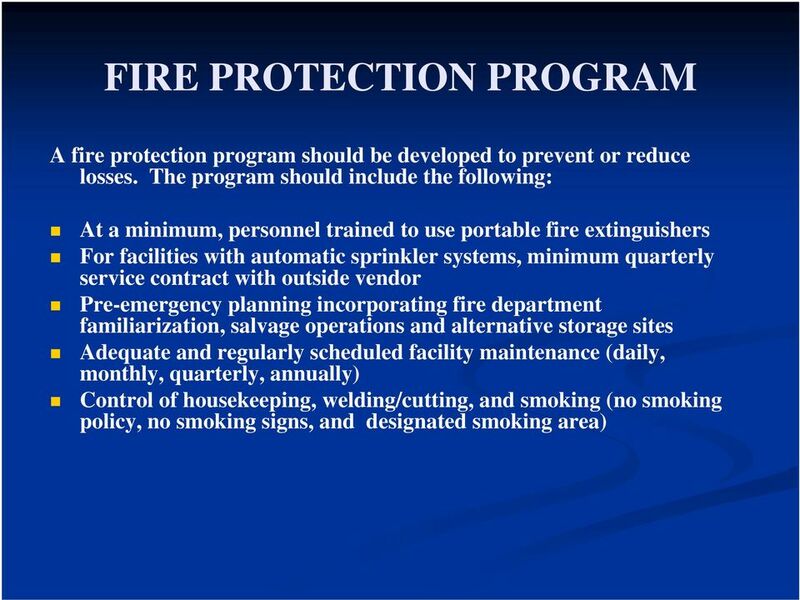 Individual safety responsibilities for both management and employees are included and considered necessary to minimize loss potential. 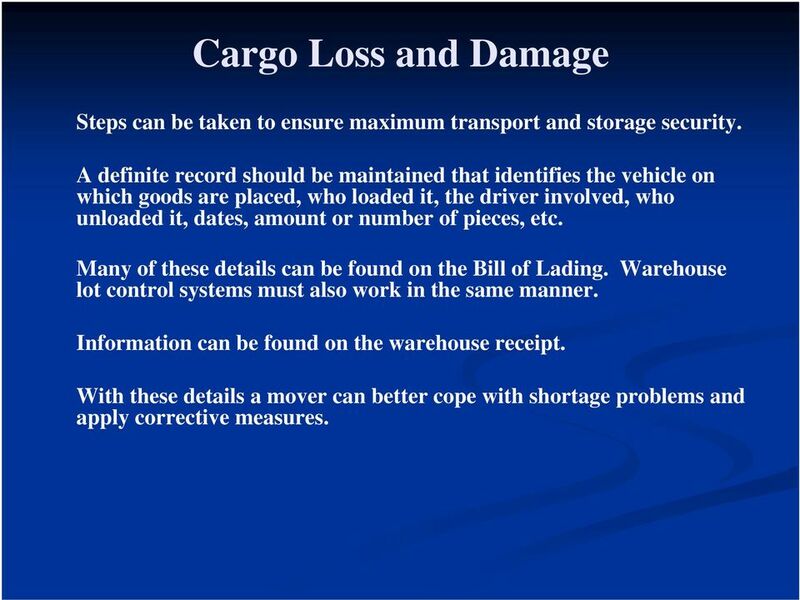 4 Cargo Loss and Damage Steps can be taken to ensure maximum transport and storage security. A definite record should be maintained that identifies the vehicle on which goods are placed, who loaded it, the driver involved, who unloaded it, dates, amount or number of pieces, etc. Many of these details can be found on the Bill of Lading. Warehouse lot control systems must also work in the same manner. Information can be found on the warehouse receipt. With these details a mover can better cope with shortage problems and apply corrective measures. 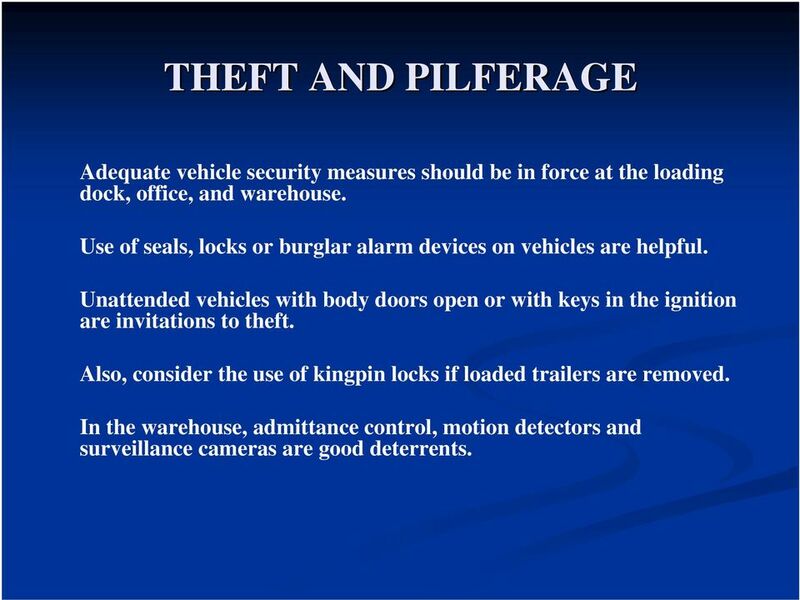 5 THEFT AND PILFERAGE Adequate vehicle security measures should be in force at the loading dock, office, and warehouse. Use of seals, locks or burglar alarm devices on vehicles are helpful. Unattended vehicles with body doors open or with keys in the ignition are invitations to theft. 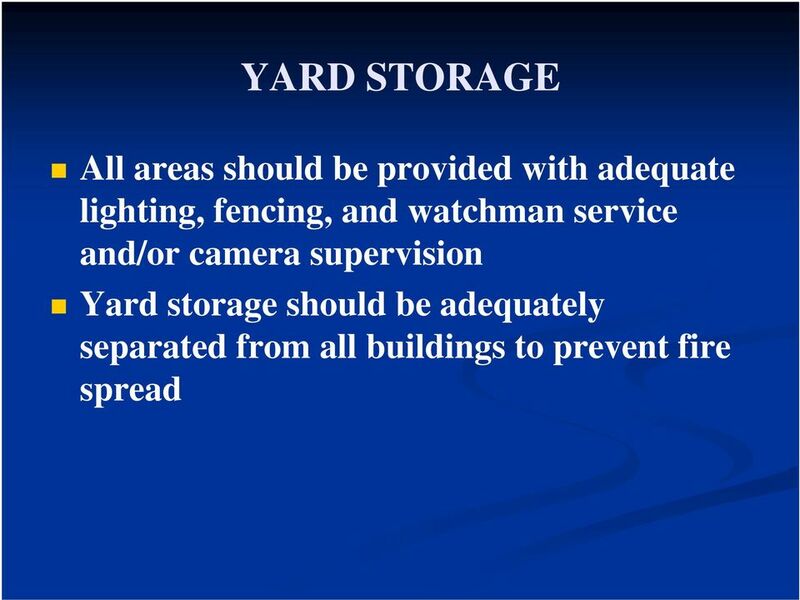 Also, consider the use of kingpin locks if loaded trailers are removed. In the warehouse, admittance control, motion detectors and surveillance cameras are good deterrents. 6 IMPROPER HANDLING, LOADING, UNLOADING OR STOWING All cargo must be adequately secured, covered, padded, blocked, chocked and shielded to prevent shifting and bumping during transit and storage. Moving equipment should be used properly (dollies, hand trucks, pallet jacks, etc.) and assistance requested when needed. 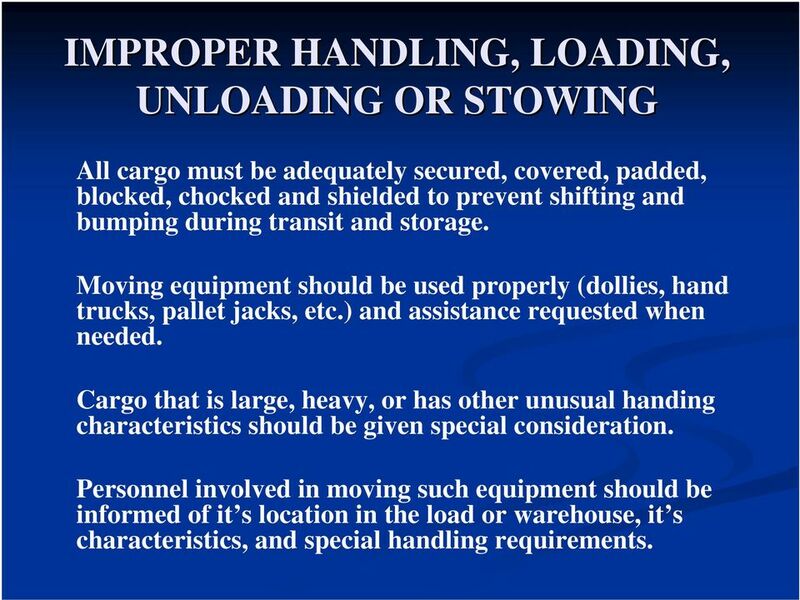 Cargo that is large, heavy, or has other unusual handing characteristics should be given special consideration. Personnel involved in moving such equipment should be informed of it s location in the load or warehouse, it s characteristics, and special handling requirements. 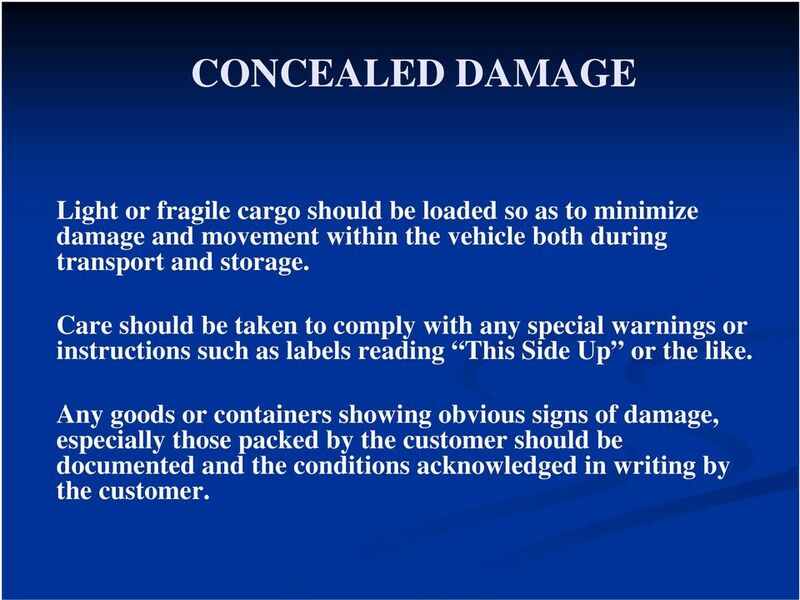 7 CONCEALED DAMAGE Light or fragile cargo should be loaded so as to minimize damage and movement within the vehicle both during transport and storage. Care should be taken to comply with any special warnings or instructions such as labels reading This Side Up or the like. Any goods or containers showing obvious signs of damage, especially those packed by the customer should be documented and the conditions acknowledged in writing by the customer. 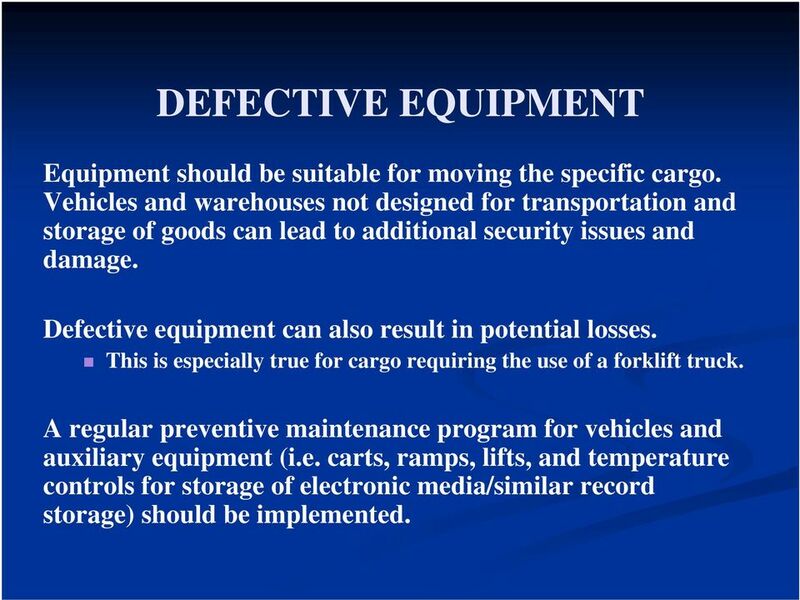 8 DEFECTIVE EQUIPMENT Equipment should be suitable for moving the specific cargo. Vehicles and warehouses not designed for transportation and storage of goods can lead to additional security issues and damage. Defective equipment can also result in potential losses. This is especially true for cargo requiring the use of a forklift truck. 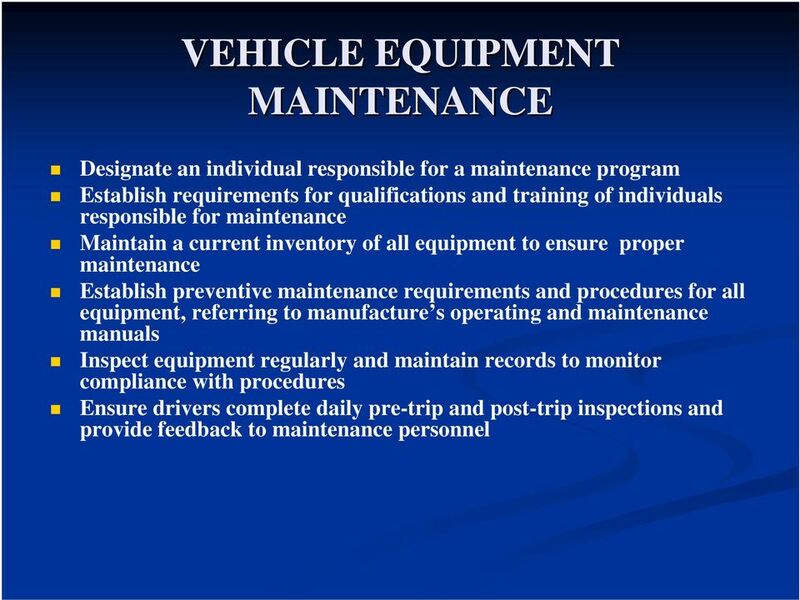 A regular preventive maintenance program for vehicles and auxiliary equipment (i.e. carts, ramps, lifts, and temperature controls for storage of electronic media/similar record storage) should be implemented. 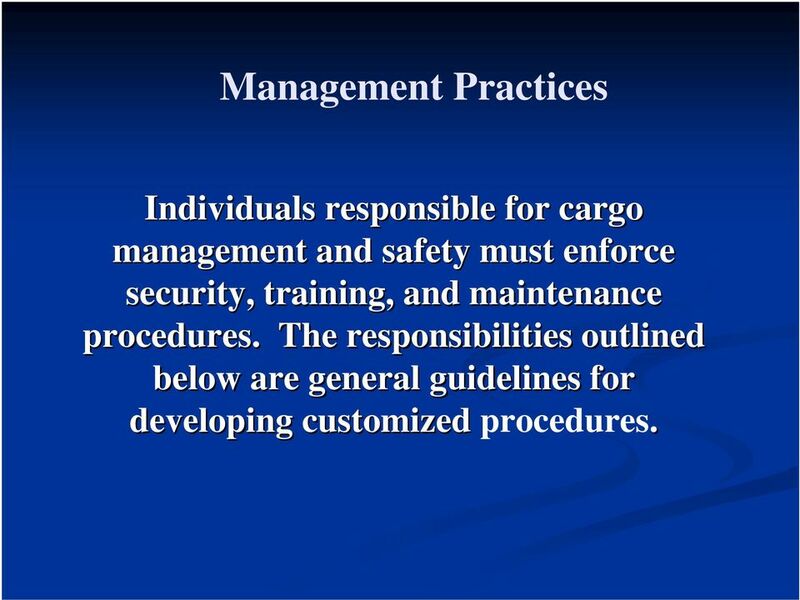 9 Management Practices Individuals responsible for cargo management and safety must enforce security, training, and maintenance procedures. The responsibilities outlined below are general guidelines for developing customized procedures. 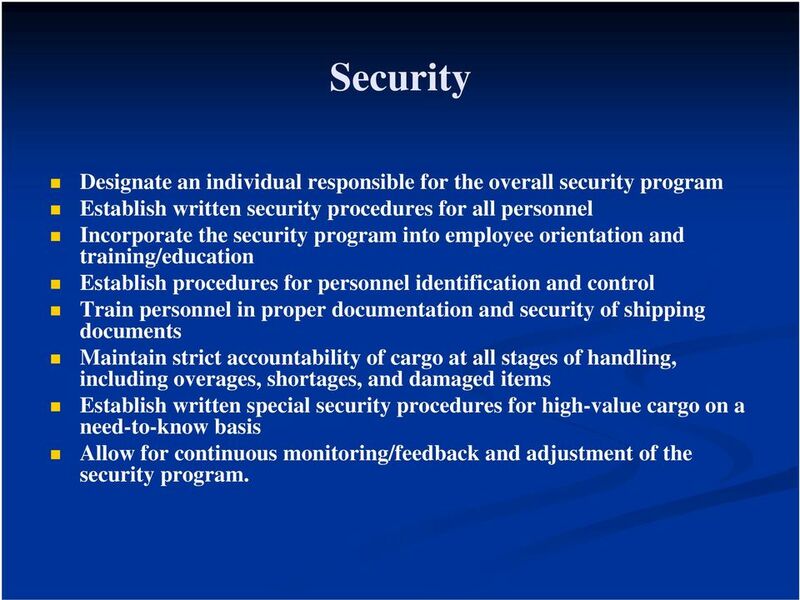 10 Security Designate an individual responsible for the overall security program Establish written security procedures for all personnel Incorporate the security program into employee orientation and training/education Establish procedures for personnel identification and control Train personnel in proper documentation and security of shipping documents Maintain strict accountability of cargo at all stages of handling, including overages, shortages, and damaged items Establish written special security procedures for high-value cargo on a need-to-know basis Allow for continuous monitoring/feedback and adjustment of the security program. 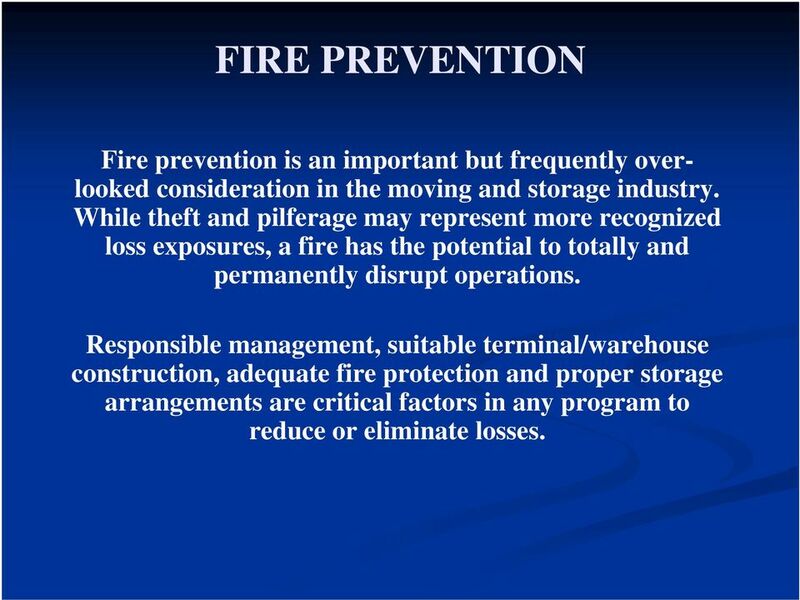 13 FIRE PREVENTION Fire prevention is an important but frequently overlooked consideration in the moving and storage industry. While theft and pilferage may represent more recognized loss exposures, a fire has the potential to totally and permanently disrupt operations. 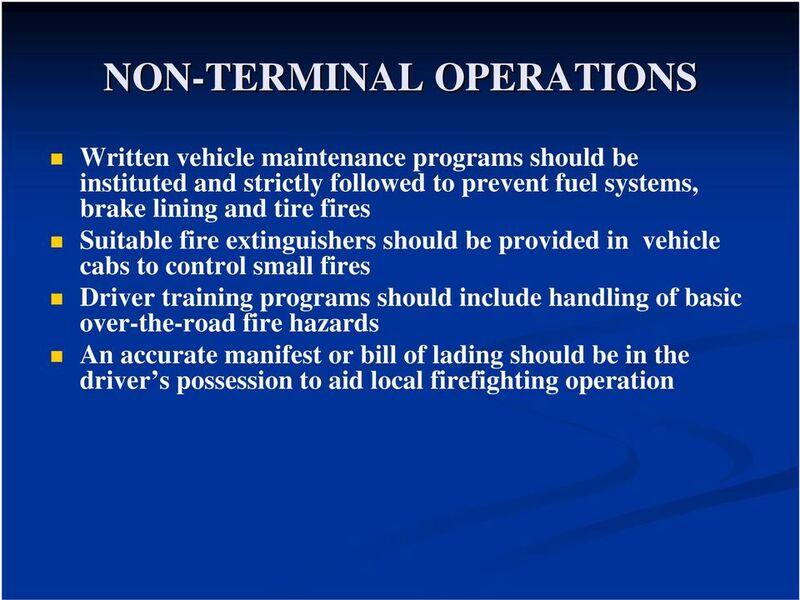 Responsible management, suitable terminal/warehouse construction, adequate fire protection and proper storage arrangements are critical factors in any program to reduce or eliminate losses. 21 FORKLIFT BATTERY CHARGING Electric forklifts are also used at many locations. 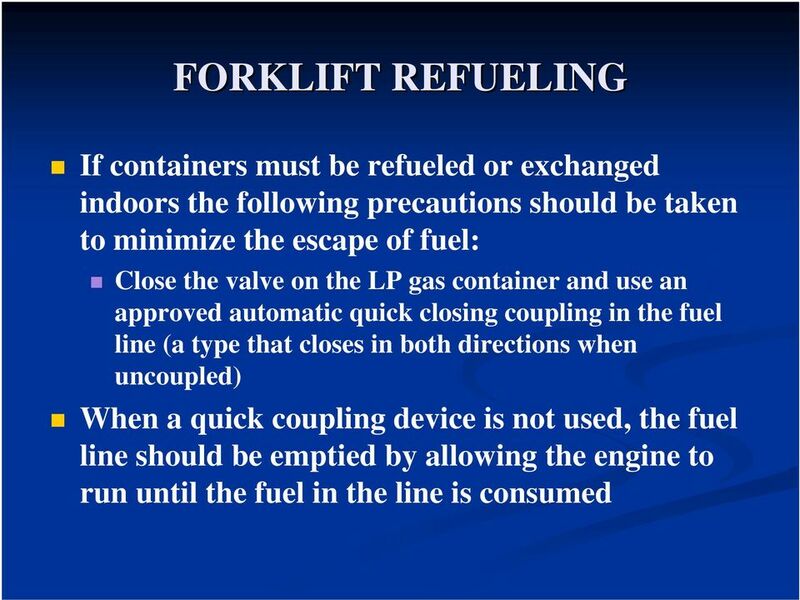 During charging, electric forklift batteries give off hydrogen gas. 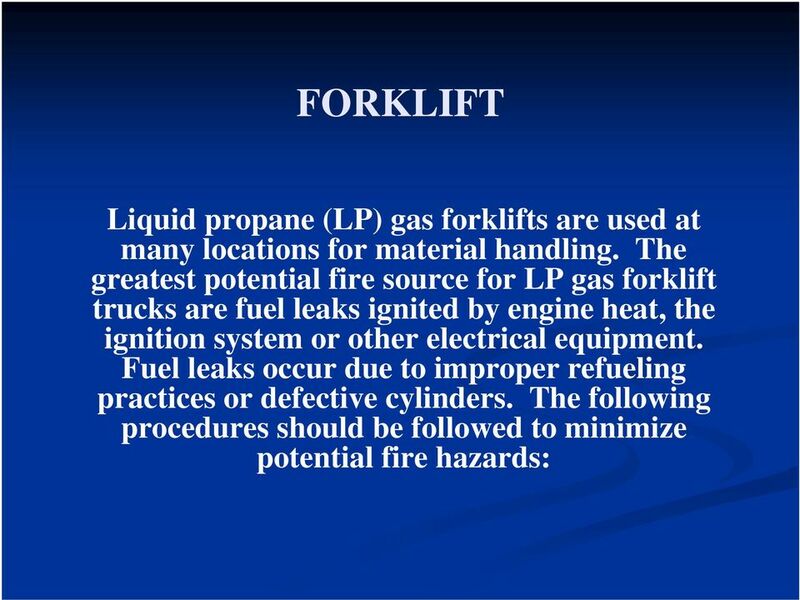 In certain concentrations gases can be explosive. Therefore battery charging operations should be conducted in a designated area having adequate ventilation. 22 HOUSEKEEPING A clean warehouse is a safer place to work. A dirty floor can be an accident just waiting to happen. Oil spots, sawdust, and dust all add to the problem. And, because of its size a warehouse can become cluttered and it is hardly noticed. 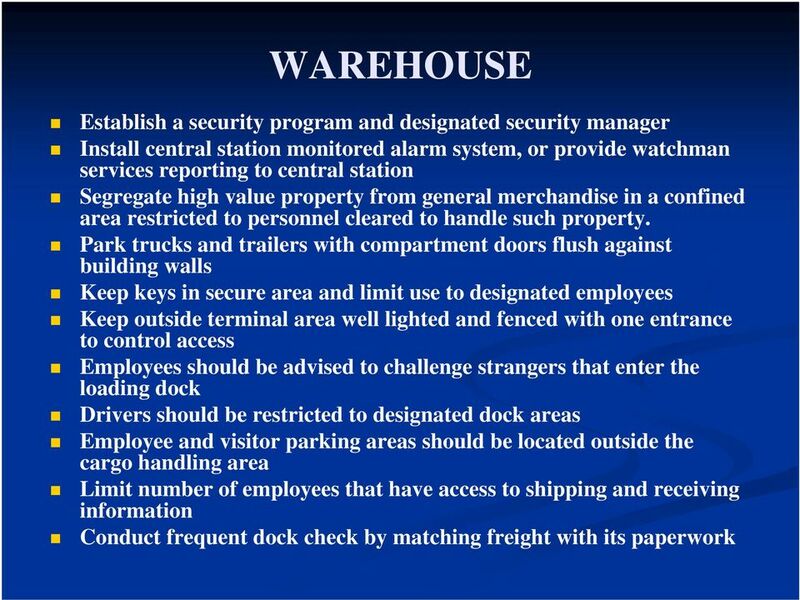 These are the reasons for a weekly inspection of all warehouses and facilities. Take the person responsible for each area with you and point out the problems that need correction. Note the corrections to be made on your personal note pad so that you can reinspect the following week. Use this system and you can be sure that progress will be made. Your facility will become a show place for customers to visit and inspect. A clean facility will get you more business!! 23 HOUSEKEEPING Ensure all places of employment, passageways, storerooms, and service rooms are kept clean and orderly and in a sanitary condition. The floor of every workroom shall be maintained in a clean and, so far as possible, a dry condition. Where wet processes are used, drainage shall be maintained, and false floors, platforms, mats, or other dry standing places should be provided where practicable. To facilitate cleaning, every floor, working place, and passageway shall be kept free from protruding nails, splinters, holes, or loose boards. 24 HOUSEKEEPING Aisles and passageways - Where mechanical handling equipment is used, sufficient safe clearances shall be allowed for aisles, at loading docks, through doorways and wherever turns or passage must be made. Aisles and passageways shall be kept clear and in good repairs, with no obstruction across or in aisles that could create a hazard. Permanent aisles and passageways shall be appropriately marked. Covers and/or guardrails shall be provided to protect personnel from the hazards of open pits, tanks, vats, ditches, etc. 25 HOUSEKEEPING Floor loading protection - In every building or other structure, or part thereof, used for mercantile, business, industrial, or storage purposes, the loads approved by the building official shall be marked on plates of approved design which shall be supplied and securely affixed by the owner of the building, or his duly authorized agent, in a conspicuous place in each space to which they relate. Such plates shall not be removed or defaced but, if lost, removed, or defaced, shall be replaced by the owner or his agent. It shall be unlawful to place, or cause, or permit to be placed, on any floor or roof of a building or other structure a load greater than that for which such floor or roof is approved by the building official. 26 SAFETY TRAINING An office that has a good safety training program will have fewer accidents and less claims. That has been proven time and again. A good safety program must start with new hire safety orientation. 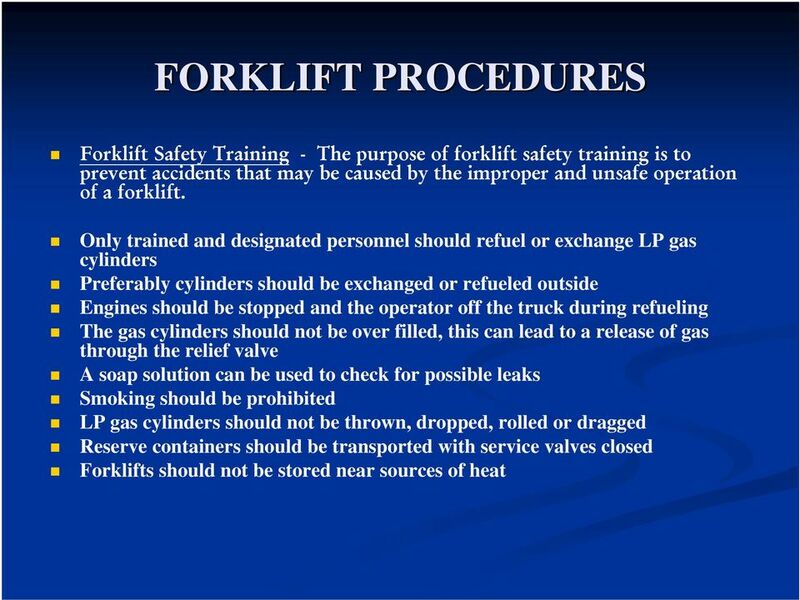 This procedure applies to all PPG and contractor personnel operating Fork Trucks at the Lake Charles facility. RULES & REGULATIONS. FOOD AND BEVERAGE Food sampling: Any exhibitors wishing to have external food for sampling. c. As mandated by law, facilities must obtain and maintain valid zoning permits as well as permits for intended use. WEEKLY SAFETY MEETING All Euramax Subsidiaries HOUSEKEEPING. Safety Meeting Contents. Meeting Notice. Leaders Guide. Employee Handout. 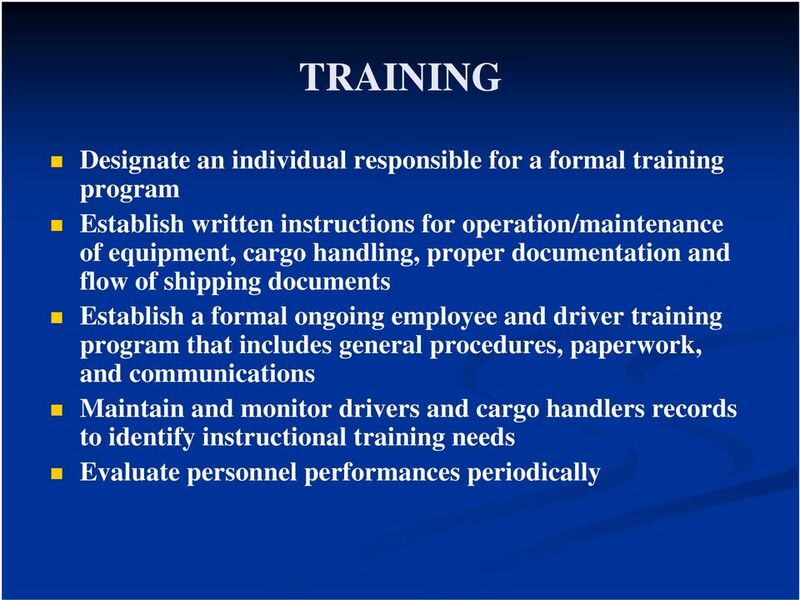 "DOT GENERAL AWARENESS TRAINING: HANDLING AND TRANSPORTING HAZARDOUS MATERIALS SAFELY"